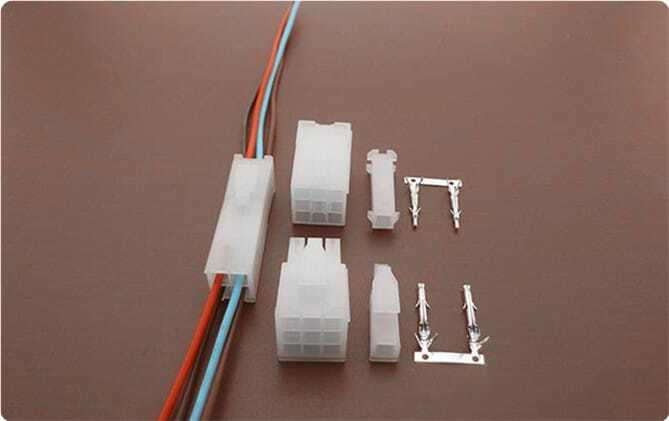 SCT4140 Series are compatible with JST FL 4.14mm pitch series connector. Scondar offers SCT4140 Series as a replacement and a cheaper alternative of JST FL 4.14mm pitch wire-to-wire connector in a complete package including the male housing, female/receptacle housing, female terminal and male terminal, all manufactured with precision-fitting and durability ensuring accurate mating in electronic devices. The JST FL series is designed with a slim profile, but robust enough for industrial applications achieving maximum electrical performance with current ratings up to 10A max per contact, commonly found in household appliances, industrial controls and network systems. These wire-to-wire connectors are available in free hanging and panel mount configuration and crimped on wires. Produced with an added layer of versatility, the JST FL series can accept a combination of both pins and sockets in the same housing. Wrapping the connector body is a heat resistant resin allowing reflow soldering, preventing thermal shocks. The connector may also be available in either the normal or reverse configurations. This feature is much needed for applications and fittings requiring protection and sealing. You can expect that your wire-to-wire connector package is undisturbed during the trip and has maintained its vitality even during your production stages, which is why a lot of our customers has raved about our product for both cheaply-priced and, at the same time, resembles the JST FL 4.14mm pitch wire-to-wire product in performance and quality.